No-Sort Recycling is a state-of-the-art process which enables paper, cardboard, plastic, glass, and metal cans to be collected together in one bin without the need to separate. Can I throw everything into my No-Sort Recycling bin? NO. Your No-Sort Recycling bin is for No-Sort recyclables only. 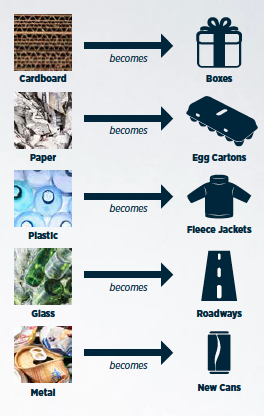 Items that can’t be recycled should be tossed into your trash bin. For information about other types of recyclables, please call 877-884-6331. Recyclables should be empty and rinsed clean of food residue. Corrugated cardboard boxes should be broken down into 2′ max pieces. Lids and caps under 2″ wide must be removed and thrown in the trash. DO NOT tie newspaper, cardboard or jugs with twine. Handles should be removed from pails and paper bags. What type of metal can I recycle in my bin? Aluminum and tin cans are acceptable. NO other metal items of any kind should go in the bin. Can I recycle large plastic items? 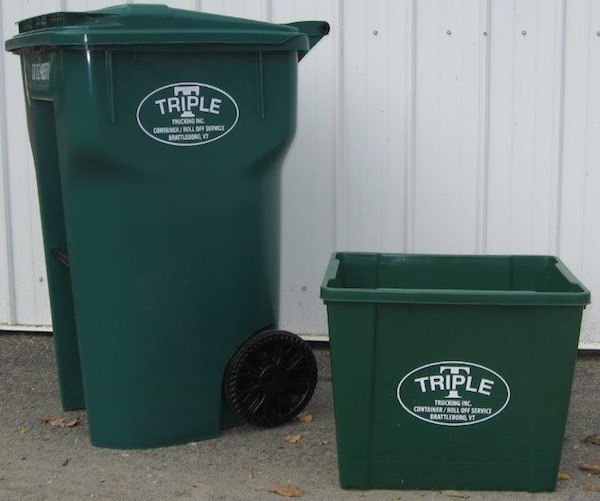 carts, toys, and storage/trash containers are NOT ALLOWED in your recycling bins. Can I put my recyclables in plastic bags? NO. Plastic bags are not accepted in the No-Sort Recycling program. Many grocery and retail stores offer plastic bag recycling. The only exception is for shredded paper, which should be sealed in a clear plastic bag and placed into your recycling bin. No-Sort Recycling puts your discarded materials back into the world and not into the landfill. THE SINGLE BIN THAT SAVES YOU TIME AND EFFORT!